When Pope Francis met executives from the United Nations agencies, led by U.N. Secretary-General Ban Ki-moon, he urged them to challenge all injustice, the "economy of exclusion," the "throwaway culture" and to "protect the family." For his part Ban hailed the personal commitment of Pope Francis to eradicating poverty and promoting sustainable development during their meeting at the Vatican Friday. "I count on the Catholic Church, under your leadership, to continue to work closely with the United Nations to promote a life of dignity for all. "Our meeting today will send a very strong message of solidarity in our common cause." Ban said. Francis said "an awareness of the dignity of each of our brothers and sisters whose life is sacred and inviolable from conception to natural death must lead us to share with complete freedom the goods which God's providence has placed in our hands." He noted this included not just "material goods but also intellectual and spiritual ones, and to give back generously and lavishly whatever we may have earlier unjustly refused to others." 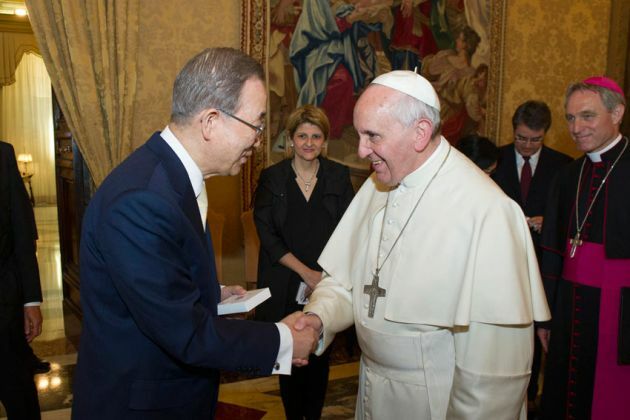 It was not the first time the U.N. Secretary General was meeting Pope Francis - or his predecessor, Pope Benedict XVI. Ban hosted Pope Benedict in New York during his visit to the United Nations in 2008 and he met with Pope Francis in the Vatican a year ago. This time Ban brought with him the heads of the U.N. agencies, around 50 senior U.N. officials who were meeting in Rome. The Catholic Church and U.N. agencies, some of which are accused by the Church of providing easy abortion and birth control, have in the past been at loggerheads over traditional family values, but they normally concur on the fight against poverty. The Vatican also endured an unusual grilling at the United Nations in Geneva in January when it was forced to speak publicly about allegations that its actions protecting predator priests fueled child abuse. The questioning came when Monsignor Silvano Tomasi, the head of the Holy See delegation at the United Nations in Geneva was delivering a report to the Committee on the Convention of the Rights of the Child. At Friday's audience, Francis reflected on the U.N.'s target for Future Sustainable Development Goals. "Future Sustainable Development Goals must therefore be formulated and carried out with generosity and courage, so that they can have a real impact on the structural causes of poverty and hunger, attain more substantial results in protecting the environment, ensure dignified and productive labor for all." The goals, said Francis, should "provide appropriate protection for the family, which is an essential element in sustainable human and social development." Ban met with the Pontiff following two days of meetings in Rome with the U.N.'s most senior executives to discuss the world body's global mission to promote peace, human rights and sustainable development. "We represent the family of the United Nations – and we meet at a time of test for the human family," Ban said during his audience with the Pope. "Inequality is growing. Injustice is prevalent. There is too much intolerance among peoples and faiths. All of these aggravate insecurity." The UN chief cited horrific fighting between Christians and Muslims in the Central African Republic; the ongoing crisis in South Sudan; the Syrian conflict, now in its fourth year; tensions in Ukraine; and the growing impacts of climate change around the world. "Across the U.N. agenda, I see the need for calm, compassion, cooperation and courage," said Ban. "Your Papacy embodies these principles and has inspired people in all regions and from all backgrounds. We deeply appreciate your personal commitment to eradicating poverty and promoting sustainable development. "